My business partner recently wrote a glowing blog about his Disney experiences. There's no doubt that Disney does entertainment remarkably well. I'll bet Walt is smiling as he looks down from that Magic Kingdom in the sky. That said, entertainment properties such as Disney have no real understanding of, or appreciation for, journalism. To them, it's an expense item. Period. Journalism has really taken it on the chin in recent years. First, there were the acquisitions of ABC, NBC and others by media conglomerates. Then came the rise of the 500-plus cable channel universe. The real cataclysm, though, came with the social media explosion that gave rise to millions upon millions of citizen journalists. Choices were everywhere and everyone was calling herself a journalist. What was a poor news network to do? ABC News never had a Walter Cronkite or Huntley/Brinkley. But, the network has produced some of the profession's best newscasters and journalists all the same. 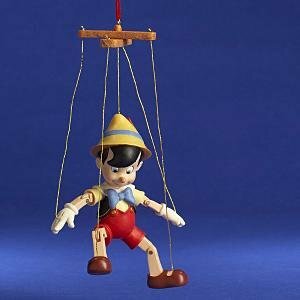 The stripped-down remnants of the remaining operation prompt a Disney-like analogy in my mind: ABC News is Pinocchio to Disney's Geppetto. When business and entertainment types control the strings, objective news coverage suffers. And, we all pay the price for a society that continues to be dominated by sleazy tabloid 'news' as opposed to true journalism. Where are Woodward & Bernstein when we really need them? This entry was posted in Uncategorized and tagged ABC, David Westin, Disney, job cuts, journalists, social media by RepMan. Bookmark the permalink. A Journalism degree today is as valuable as an 8-track player. Every blogger who puts up a shingle and breaks a news story claims to be a journalist — with plenty of unnamed sources. Great point. I can’t imagine why anyone would still spend $75k for a graduate degree in journalism when the industry is falling apart at the seams. While I agree that Disney sees ABC News as a resource-hogging cash drain, in their day, Peter Jennings and Ted Koeppel were decent examples of leadership and integrity in broadcast journalism. They were near Cronkite’s caliber. But that’s ancient history now. With all this blood-letting, words like trust, integrity, research and leadership must seem like sick jokes to the survivors at ABC News – and countless other news organizations.